Manama: An Egyptian driver, who on Thursday rammed his truck into a pickup carrying US soldiers in Kuwait City, has admitted his allegiance to the Daesh terror group. Ebrahim Sulaiman told investigators that he supported the group and believed that its leader Abu Bakr Al Baghdadi should be the head of all Muslims. He said that he had been using the Internet to follow the killing operations and the explosions carried out by the group, Kuwaiti daily Al Rai reported on Monday. Ebrahim, 38, said that his attempts to learn how to make an explosive belt from the Internet had failed as he did not have the required items. Sources told the daily that a DNA sample was taken from the suspect to help investigators check whether he was connected in any way with terror-linked activities in the country. The investigation launched by the security agencies following the attack included 20 suspects who had links with the suspect, the sources said, adding that 12 were released after it was proven they were not implicated in any suspicious action. The remaining eight suspects are still under investigation. The imam of a mosque was among those who were questioned after investigators found in the main suspect’s wallet a letter with instructions on how to spend the cash he left with him. 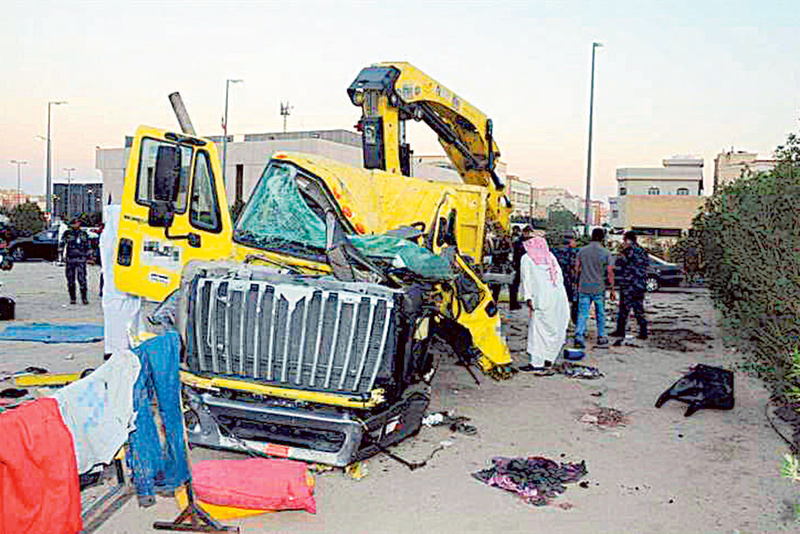 The probe revealed that KD1,300 were for fixing a vehicle and KD2,000 to be handed over to the suspect’s family. The investigation also included employees in a charity foundation attended by the suspect and some of his colleagues. Acquaintances said that Ebrahim was very open about his extremism and his hatred for Americans whom he blamed for all the problems plaguing the Arab world, particularly Egypt, his home country, the source said. The suspect, who will complete four years of residency in Kuwait in February, has been working for a company with contracts with the municipality of Kuwait. His family remained in Egypt. “The embassy is in close contact with the Government of Kuwait regarding the incident, has received the full support of the Kuwaiti authorities, and is coordinating with them on the investigation,” the statement said. On Saturday, Kuwait’s interior ministry said that an Egyptian driver rammed his heavy truck into a pickup truck carrying five US soldiers in Kuwait City. The driver was injured in the failed attack and taken to hospital. Following preliminary investigations, a letter hand written by the suspect was found in his possession. The letter included his pledge of allegiance to the terrorist group, and the adoption of its ideology, the ministry said.